Advantek sued Shanghai Walk-Long Tools (“Walk-Long”) for design patent infringement of U.S. Pat. No. D715,006 in the Central District of California. In response to the complaint, Walk-Long moved for judgment under Rule 12(c), arguing that prosecution history bars infringement. During prosecution, the examiner issued a restriction requirement as between two different embodiments. The embodiment (below, left) shows a skeletal structure of the gazebo, while the second embodiment (below, right) shows the skeletal structure with the addition of a cover. In response to the restriction requirement, the applicant canceled the second embodiment. After prosecution, the design patent—directed to the first embodiment—issued. 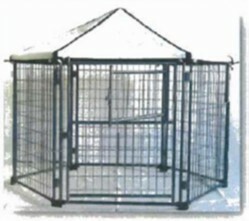 Reproduced below is an image of the accused gazebo, which includes a cover. On appeal, Advantek focused on the third prong of the Pacific Coast test, arguing that the accused design falls outside any claim scope that was purportedly surrendered. More specifically, Advantek argued that the elected embodiment was the skeletal structure and that this design was present in the accused product, with or without a cover. The Federal Circuit agreed with Advantek, finding that the accused product falls outside the scope of any purported surrender. As explained by the Federal Circuit, Advantek elected to patent the gazebo with a particular skeletal structure. A competitor can infringe regardless of extra features that the competitor might add, such as a cover. The case was remanded to the district court for further proceedings. The Advantek decision is relevant for design patent prosecution because restriction requirements are routinely issued in design patent applications. The decision is also relevant for design patent litigation because it provides guidance on prosecution history estoppel as well as the scope of damages available for infringement. If you have questions regarding this ruling, please contact Fitch Even partner Jon A. Birmingham, author of this alert. For more information on recent cases involving design patents, access a recording here of the August 2018 Fitch Even webinar, Design Patent Enforcement: Recent U.S. Court and PTAB Decisions.